Anyone who will be spending New Year’s Eve in Florence and wants to spend the last night of the year outside can choose from four different free performances. In the main square right in front of Santa Maria Novella train station a rock concert will take place starting from 9.00 pm where great Italian singers Irene Grandi, Lucio Dalla and the Negrita will be performing. After them there will be a DJ set going on until 2.00 am. Irene Grandi (Florentine singer) and the Negrita (Tuscan rock band) are both Tuscan musicians and are loved by mostly young people, while Lucio Dalla (singer from Bologna) is generally more appreciated by a more grown up crowd. This is probably the main attraction for Florence’s New Year’s Eve celebrations, a result of a profitable collaboration between the Municipalities of Florence and Bologna. In fact, the two cities are going to exchange some musicians during the celebration: Lucio Dalla will first sing in Florence and then he will move to Bologna, while the Negrita will do the opposite. This exchange will take place thanks to the special high speed rail service called Frecciarossa that can be caught by all those lucky people that will get a free ticket for the event distributed in Piazza della Repubblica from December 29th. The second concert will be held in Piazza della Signoria where party goers can attend a classical performance by the Ukrainian Philharmonic Orchestra directed by Giuseppe Lanzetta. The third choice for celebrations will start at 10.30 pm in Piazza Santissima Annunziata where Riccardo Marasco, a famous Florentine singer will perform his best songs. Lastly, between Piazza Duomo and Piazza delle Repubblica the street orchestra Banda Improvvisa will perform. This year Florence will be animated by many different events on December 31st and we cross our fingers for mild weather so that you can enjoy the New Year’s celebrations without cold or rain! Those who decide to lodge around the city center and don’t have an accommodation in Florence yet, can have a look at this list of hotels and B&B in Florence center. 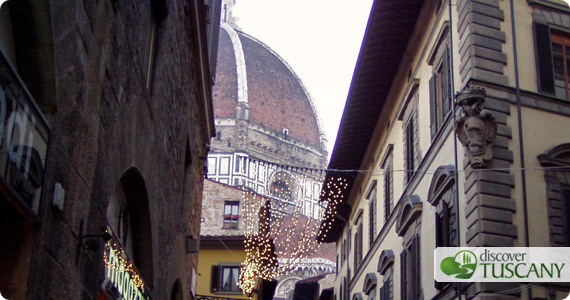 Here is also a useful list of Florence museums open on December 31 and January 1. Many museums will close in the early afternoon on Tuesday and almost all of them will be closed on January 1, unfortunately. Discover Tuscany team wishes you a Happy New Year!